A number of workplace observers have opined recently that it is time to get rid of email and move to a different form of work-related communication. We would think that Hillary Clinton could hardly be more on board with this idea at this point in her political career. Email as a regularly used electronic form of communication did not exist when she entered the national political scene as first lady. Now it has become, without exaggeration, the bane of her political existence. It is hard to underestimate the degree to which the average American associates Clinton with a single word: "email." For the most part, this association is negative, not positive. We found that "email" was by far the most frequently used word when we asked Americans what they had read or heard about Clinton back in August 2015. As my colleague Lydia Saad and I put it then: "When Gallup recently asked Americans to say what they recall reading or hearing about her, one word -- 'email' -- drowned out everything else." Now we are asking Americans every day the same basic question -- what they have read, seen or heard about Clinton -- and once again, "email" dominates. For interviews conducted Oct. 28-31, "email" drowns out everything else, particularly anything relating to policy or substance. Indeed, the second-, third- and fourth-most-frequently used words associated with Clinton also relate to emails: "FBI," "investigation" and "scandal." Americans have commonly used "email" to describe what they recently heard, read or saw about Clinton for many of the weeks since Gallup began tracking these perceptions in July. Attention has shifted to something else only during major events of the general election. For Clinton, this was true of the July 25-28 Democratic Convention and her three debate performances on Sept. 26, Oct. 4 and Oct. 9; and then in mid-September, when her health became a national focal point after she nearly collapsed while leaving a Sept. 11 memorial ceremony. And Donald Trump's attempts to spread this news and keep it in the spotlight appear to be having an effect: "email" and "FBI" are two of the three most common words Americans use when they mention what they have recently read, heard or seen about Trump, allowing mentions of his own recent scandals to fade. How are Americans discussing this startling twist in a presidential campaign that was already in no short supply of them? They typically summarize what they understand to be the facts -- the FBI is "reopening" the email case on the basis of a newly discovered email cache. Some offer further details about the incident -- mentioning disgraced former New York Rep. Anthony Weiner, who is cooperating with the FBI in a separate investigation that uncovered this email trove. But more than a few Americans call Clinton a "liar" or a "crook" as they mention this news; others offer familiar refrains that she belongs in "prison," or should not be allowed to run for president. It is remarkable that this constancy of emails has continued despite a shift in the types of emails that are in the news. In 2015 and earlier this year, the association of emails with Clinton was related to the private server she set up when she became secretary of state, and what happened to those emails when she was called on to release them to federal investigators and congressional committees. Then, in addition to this email-related situation, the public was confronted with WikiLeaks of thousands of emails sent by John Podesta, her campaign manager, and what they revealed about the workings of Clinton and her inner circle of friends and campaign associates. Now we have the FBI's announcement that it is going to review emails from Clinton's longtime assistant Huma Abedin -- emails that came to light because they were from a computer shared with Weiner, her now-estranged husband. Clinton's website is full of well-crafted and lengthy policy prescriptions and positions, and she would no doubt most like to focus on these. No matter. All of this has been subsumed by her association with emails. This certainly gives credence to those arguing for a lessened reliance on this communication tool. New York Times technology columnist Farhad Manjoo says: "Email is simply not up to the rigors of modern political and business life. It lulls us into a sense of unguarded security that it never delivers," and goes on to say that this year's "big loser" is email. Clinton and her campaign team would most likely agree. The bad news for Clinton is that all of the ways the public associates Clinton with emails -- misuse of email, email revealing things she doesn't want revealed and the way in which she has handled emails after the fact -- are negative. And these negative connotations play on an already-existing image of Clinton as dishonest, something we picked up in open-ended comments as long ago as April 2008. I have no inside knowledge, but one has to assume that Clinton has at this point forsworn email. Just a week ago we were writing that the public was hearing and reading more about Trump than Clinton. Not now. Americans' recall of hearing news about Trump is falling significantly, while their recall of hearing about Clinton has picked up over the past few days. 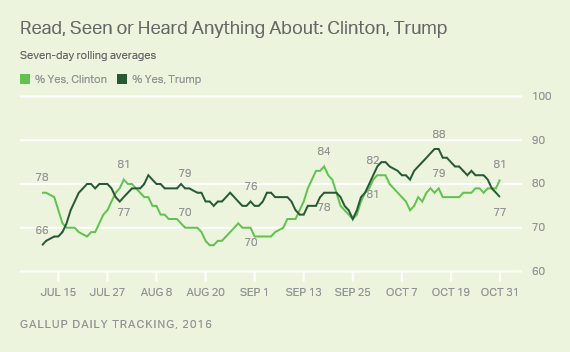 The result is that for one of the few times in the campaign cycle so far (extending back to July when Gallup began tracking it), more Americans recall hearing about Clinton than about Trump. The other times were during the Democratic convention, and after her near-collapse at the 9/11 ceremony and her announcement that she had pneumonia. We've been doing some preliminary analysis of the relationship between Americans' recall of reading or hearing about a candidate and that candidate's image. The relationships are not significant, but there appears to be suggestive evidence that when Trump is more in the news, it's bad for him and good for Clinton, and vice versa. 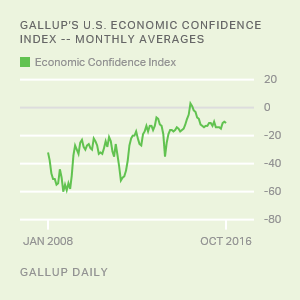 Thus, the downturn in Americans' mentions of Trump may be positive for his campaign. We don't yet, however, see strong signs that the Oct. 28 announcement of the FBI investigation is having an immediate effect on the candidates' images. Here are several ways of looking at the favorable ratings of Trump and Clinton, pre- and post-announcement. Clinton may be down a point, and Trump may be up a point, but these are not significant changes. In short, we don't see that Clinton's image has taken an immediate hit, or that Trump's image is on the upswing. We'll obviously keep monitoring this.